Meet Layla, a rescued collie from an Iowa shelter who is 3 years old and a new member of our family. She is very loving, very well trained and very sweet and fun. The kids are in heaven. I grew up with dogs and have always wished we could have one. The kids absolutely love dogs and have begged for years. We kept saying it wasn’t practical for this reason or that reason to get one. She has lived with us for just over 24 hours but she has really made herself at home and even the cats have decided she’ll do. She also acts as if we’ve been hers forever. 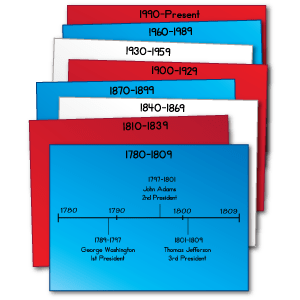 Help students study the presidents of the United States with this handy timeline. Divide the class into eight groups and give each group a large sheet of red, white, or blue construction paper. Assign each group a span of years shown. Then have the group program its timeline section with the names and terms of the presidents inaugurated during that time period, along with any other significant historic events. Finally, tape the sections together in order, end to end, to create a large timeline to display in your classroom. I’m having Daryl pick up some red, white and blue construction paper and putting this on the agenda for sometime soon. We had a fun family adventure last week! Daryl, Jack and Anna taught hundreds of school kids about old time games and music. 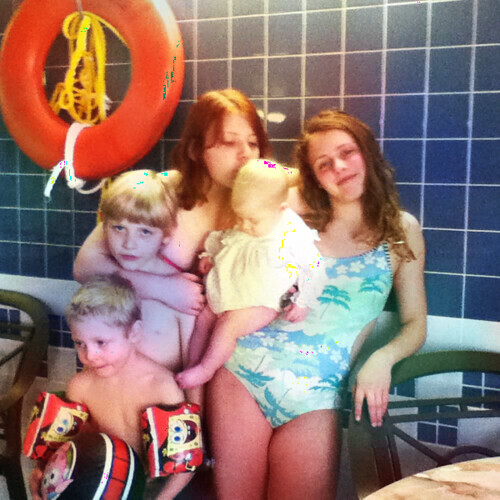 The program was for a school district about an hour away (a homeschool friend on their library board recommended us), and they paid for us to spend two nights at a local hotel and reimbursed our gas and expenses, which made it into a fun family (working) vacation. Anna taught kids how to roll hoops. Jack taught the game of graces. Daryl taught how to play the spoons and the washboard, plus talked about the way people lived during Laura Ingalls Wilder’s time in our area. We got to visit with some wonderful homeschool friends we don’t get to see often, went to a great photography gallery (where they gave us two gorgeous books of photography as a thank you from the town!) and had a great few days. Jack and Anna were exhausted — physically and emotionally — after two days of so many excited school kids. I was so proud of them, though, and I heard one little girl shout as she left, “This was so fun!”.